Many cities are installing climbing lanes in an attempt to expand bicycle infrastructure. A climbing lane generally is a 5 foot wide painted lane beside a curb or parked cars for bicycles travelling uphill slower than normal traffic. Bicycles moving in the other direction (downhill) will be going faster, so they do not require a special lane. They can keep up with traffic and can share the lane with cars. This at least is the argument. The question is whether or not climbing lanes are useful for bicyclists or are they just a way for cities and municipalities to claim progress for improving bicycle infrastructure without serious investment? I generally am happy to see climbing lanes because they indicate that cities at least are thinking about bicycle infrastructure issues. Without the lanes, for narrow roads bicyclists just stay in the middle of the lane and slow down traffic or if possible take to a sidewalk. Experienced riders are probably safer without the climbing lanes. Inexperienced riders actually may gain a false sense of security from having such lanes, because in most cases separation from cars is pretty minimal. I started thinking about climbing lanes after riding my bike towards home on a local street with a climbing lane. During rush hour on this street avoiding car doors and temporarily cars parked in the bike lane is a common problem. In the next section I recount one ride on this street with a climbing lane and the issues that I faced in having a safe transition between neighborhoods. I’m riding up a short hill on Van Ness Street, a three lane road with parked cars on the right, two car lanes and a painted bike lane. The climbing lane is narrow at 5 feet wide, with barely enough room for swinging car doors (figure 1). The traffic lane by the bike lane is also narrow at 9 feet wide. Due to the possibility of swinging car doors I stay on the left side of the climbing lane almost in the traffic lane. Cars in driveways on my right also capture my attention because they look like they are ready to back out. I see a car stopped up ahead and see it is going to park. To do this the car has to back up through the climbing lane. After stopping I’m expecting the driver to swing open the car door into my path. With a small gap in traffic behind me, I first signal with a hand outstretched to my left side and then I move decisively into the center of the car lane. I hear a car rush up behind me. The driver honks his horn. It is not a blaring horn, but rather is a “don’t you know there’s a bike lane” horn. I shrug and keep in the center of the lane so that the driver can’t squeeze by me (figure 2, area of street that driver passes me). Just as expected the recently parked car door opens directly into the path of the bicycle lane. After passing the parked car I swing back into the bike lane and use a circular hand signal for the car behind me to pass. He passes me fairly close on my left. Up ahead the Van Ness Street climbing lane disappears and becomes a combined car and bike lane (sharrows) with no room to pass cars on the right (figure 3). This is 100 feet before a traffic light at the top of the hill. For the second time I move again into the center of the right traffic lane behind four cars waiting at the light. Once the light turns green I follow the cars through the intersection. Just past the light, the lane widens to more than 15 feet. Without parked cars on the right this feels almost like an unmarked bicycle lane. Unfortunately up ahead the sidewalk juts out into the roadway to make it easier for pedestrians to cross the street (see arrow in figure 4). I have to leave the friendly side of the road with a lane virtually to myself and merge back into traffic for the third time in order to make a right hand turn. I then turn right turn into the calm neighborhood streets. Once I make the turn I am on lightly traveled suburban streets. With frequent stop signs cars are moving slowly (10 to 20 miles per hour) and I now can enjoy my ride home without the tension of moving in and out of traffic. At slow speeds it is easy to establish eye contact with upcoming drivers and they are courteous, mostly smiling and returning my friendly gestures. No one resents me being in the roadway. Drivers are friendly. I’m now relaxed and enjoy the last leg of my commute home. The reason why I have described all this in detail is that installing the painted bike lanes and bringing sidewalks out into the roadway to make distances shorter for pedestrians no doubt seem like good ideas. Unfortunately when not implemented well the safety improvements actually complicate the life of bicyclists and motorists alike. Motorists feel bicycles should be in the bike lanes or keep to the right side of the road because they do not see the danger obvious to an experienced cyclist. The lanes also lead to a false sense of security for those bicyclysts with less experience. In the above example, the lanes are effective during all times except rush hour. However, when traffic picks up, several mistakes become apparent for the Van Ness bicycle climber lanes (figure 5). The first is there is no door buffer for the lanes. The second is that the traffic lane is very narrow making it almost impossible for motorist to allow the required 3 feet between for bicyclists. The third is that the lane suddenly ends near the top of the hill and bicyclists must merge into traffic right before an intersection crowded with cars. With no room to pass on the right or with cars stopped in lanes it difficult to merge into the sharrows. Fourth, the pedestrian sidewalk (see figure 4) in the subsequent intersection unnecessarily forces cyclists back into car traffic. As can be seen in figure 5, the configuration of the Van Ness Street bicycle lane (same dimension as in figure) means a bicyclist is constantly in a danger zone in heavy traffic. This is not to say I against the climbing lanes. I actually like the thought, but wish the execution was better. I would make several relevant points. At the very least the lanes should be wide enough to accommodate a bicycle and a swinging car door. Most states have standards of 5 feet for climbing lanes and some allow 4 feet which is quite narrow. Recent thought on lane design recommends that the climbing lanes be 6-7 feet wide which would make a big difference. A buffer with strips would be an improvement (figure 6). Parked cars could be removed from the street and the space would be perfect for a nice wide separated bike lane. I’m sure neighbors would squeal at this option. The cars also could be moved to the left of the bike lanes, creating a virtual separated bike lane and a more natural transition to the combination bicycle/motorist lane (sharrows). But again the lane would have to be slightly wider so that bicyclists could avoid swinging car doors and being forced into a curb. 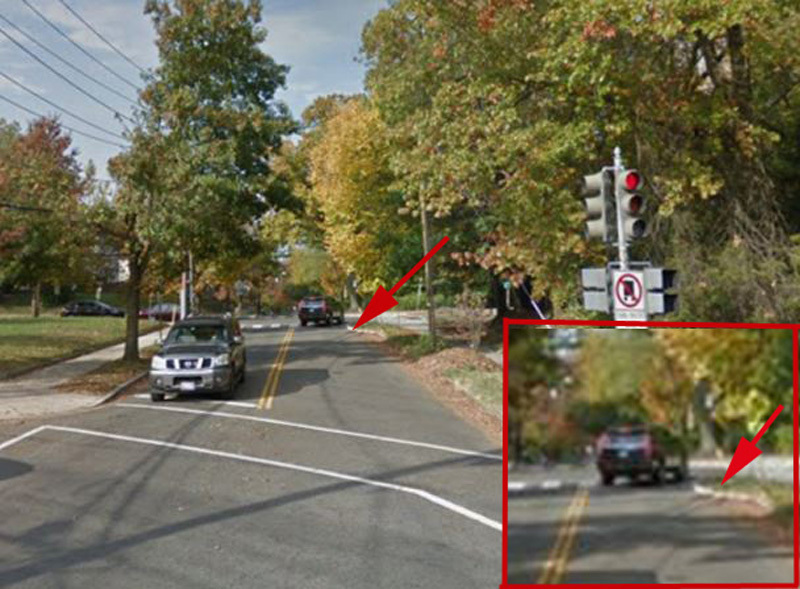 This arrangement also would give driveway cars a clearer view of bicyclists. In this situation there must be a way to keep cars from parking or stopping in the bike lanes. Painting the lane a dark green would more clearly defined the lane for both motorists and cyclists and this would be especially important in the transition area to the sharrows. A proper separated bike lane could have been created out the small park space near the intersection to avoid having a combined car and bike lane (sharrows) at the intersection of Nebraska and Van Ness Street. Such a proper separated bike lane bikes would be safe and unencumbered. It could continue through the traffic light until the gateway to the safe neighborhood streets. Sidewalks also are not the answer. The many driveways make them potentially more dangerous than riding in the road. It is illegal to use them in downtown DC, but not in the outlying areas of town. The Van Ness intersection is a gateway to quiet neighborhood streets. These types of intersections are important for connecting neighborhoods. Much more work is required in easing travel between safe neighborhood streets for crossing busy roads in Washington, DC. I am sure it is important in other cities as well. Most of the options would cost more money than paint on the road, but it also is a more serious effort to keep bicyclists safe through busy streets to safer roads. The point is that the creation of bicycle lanes should make bicyclists safer and not more vulnerable. There are tradeoffs. But inviting more cyclists into the streets with facilities that are not well thought out seems to be self-defeating. I am glad to have the climbing lanes on Van Ness Street when traffic is light. During non-rush hour I use the lanes because I know I easily can move into the street to avoid car doors or temporarily parked cars. When traffic is heavy depending on the situation I sometimes take my place out the road and shrug when I hear the honking horns. I am with the motorist on this point. I would rather be in a safe bike lane that makes it unnecessary to take a full lane out in traffic. The conundrum is that the bicycle climbing lane on Van Ness Street is useful during light traffic as cyclists have room to maneuver. Unfortunately, this same road is crowded with cars at rush hour and the cramped lane puts bicyclists in danger. To conclude, I would rather see the climbing lane behind the parked cars with a physical buffer for swinging car doors along with obstacles to keep cars from parking in the bike lane. This would simplify the transition to the combination bicycle and car lane (sharrows) just before the stoplight. To accomplish while retaining the lane for parked cars, this would require creating more space on the roadway. This would be a more expensive option. But perhaps it is a necessary one compared to squeezing in a bike lane with so many safety compromises. Department of Transportation, Government of Seattle. 2013. “Bicycling Solutions for Hilly Cities: Seattle Bicycle Master Plan Update.” Best Practices White Paper #3, Department of Transportation, Seattle, Washington. O’Mara, Helen. 2014. “Rethinking Bike Lane Design Standards: The Importance of an Operating Concept” Presentation at the Midwestern/Western ITE District Annual Meeting, Rapid City, Iowa. O’Mara, Helen and Robert Shanteau. 2014. Rethinking Bile Lane Design Standards: The Importance of an Operating Concept. Background Paper prepared for the Midwestern/Western ITE District Annual Meeting, Rapid City, Iowa.